IT BEGAN WITH A SIMPLE IDEA. LOCAL ARTISTS SASHA PEPPER and Susan Fox joined forces in 1999 to produce a map showing the locations of workspaces for 43 artists in Arcata and Eureka. Everyone agreed to open their doors on a particular day, and North Coast Open Studios was born. The event grew slowly over the years; by 2001 there were 65 artists, 15 more joined up in 2002. In 2004 there were 92 studios on the tour in an area ranging from Trinidad to Fortuna, and the ad-hoc group of artists was working under the Ink People's umbrella with some institutional assistance from the Humboldt Arts Council. But, as in the beginning, the artists still arranged the tour themselves and pooled their funds to pay for the essential tool, the map that guides customers to the artist's doors. By last year what began as a simple one-page newsprint fold-up map had grown into a thick booklet, a catalogue of painters, potters, woodworkers, weavers and creators in various other media. This year the event took a great leap forward, expanding its range to the southern border of the county, bringing in almost 30 new artists and turning the black and white catalogue into a slick full color 32 pager filled with ads and glossy photos of artist's work. Last year's Open Studios was when Angie Schwab got involved as a volunteer helping with promotion. Schwab is a creative person, but not a working artist. She calls herself "an artist's enabler." Her business, Humboldt Artworks, is "an arts marketing and event production business featuring art and artists of Humboldt County." Schwab was a part of a group of arts organization leaders who gathered for a year as the "arts and culture cluster" under the auspices of Prosperity!, the economic development program that grew out of the Headwaters deal. One of the ideas that Schwab brought forward was using Headwaters money to help expand Open Studios. Schwab ended up writing and overseeing a $23,000 Headwaters grant supporting this year's expansion, money that had to be matched by fundraising, including sales of advertising in the brochure. Some of the grant money went to pay salaries for Schwab as project director and Pepper as artist coordinator. The rest went to the ramped up version of the guidebook. Last year's run of 2,000 books was upped to 6,000. "We paid for guidebooks along with posters, postcards and postage," said Schwab, who mailed the catalogues to interior designers throughout Northern California and Southern Oregon and to media outlets all over the state and sent postcards to Humboldt State alums and realtors throughout the state. It's all part of a larger, grander plan "to create a destination, a regional, national, even international reputation for local artists that will attract people to our region to buy art," said Schwab. "We're also trying to develop a branded image for Humboldt County around art." Schwab sees the grant as "an excellent investment for the county, because the artists who make money selling their art spend it here." Schwab admits that the transition to a more ambitious Open Studios was not without problems. Drawing in new artists in Southern Humboldt was complicated by the event's timing. An artist who was helping to recruit others in the Garberville/Redway area was not happy when she learned that the first SoHum Open Studios would be on the same weekend as the Mateel's annual Summer Arts and Music Festival. As a result she encouraged a number of artists to pull out and there are only four locations south of Rio Dell. "It will continue to grow," said Schwab. "It will take planning and cooperation. We need more communication, but we're starting to meet with the artists to put together an action plan for the future. We're hoping to experience record numbers of visitors in the next two weekends. We're hoping the artists will see this transition as a good investment. My hope is they will sell a lot of art." Open Studios guidebooks are available in the same places you find the Journal, grocery stores and coffee shops throughout Humboldt County or at local art museums. The maps and artist's listings are also posted online at www.northcoastopenstudios.com. Plan for your own Open Studios tour by attending the Central Show on Friday, June 3, 5-8 p.m. at the Ink People Center for Arts at 411 12th St., Eureka (442-8413) where many of the artists will show samples of their work. Artists' work can also be viewed at "Hot Spot" receptions including one on Friday, June 3, from 5 p.m. to 8 p.m. at the Art Cheese and Wine Festival at the Morris Graves Museum of Art, 636 F St., Eureka. (442-0278). Tickets are $20 and are available at the door. Curly's Grill, Open Studios Artists' Reception 5:30 p.m. Saturday, June 4, at 400 Ocean Ave., Ferndale, (786-9696) . 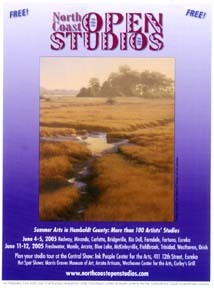 For more information about North Coast Open Studios, go to www.northcoastopenstudios.com or call 825-9039.